It was a treat to read Chris Norbury’s novel Straight River. It is a mystery that holds your attention as the plot unfolds throughout the book. Matt Lanier comes home after his father is found dead in a farming accident. Things hadn’t been good with their relationship and Matt feels guilt that perhaps his father’s death could have prevented had he listened to the message from his father and returned his call. It is easy as a reader to identify with Matt as he ponders the fate of his father and sorts out his feelings about being back home and getting reacquainted with old friends. Many of us find ourselves in the same situation. Mr. Norbury’s interpretation of his character put us into Matt’s head and lets us feel his emotions. Does his past interfere with the conspiracy theory he thinks surrounds his father’s death? I can’t wait to read his next novel in the series titled Castle Danger. Straight River is well written and an exciting read. Chris Norbury is up there with the best of the best with his writing. He deserves accolades and recognition for his skillful plot twists. This is definitely five stars in my mind. After his estranged father dies in a farming accident, professional musician Matt Lanier returns to his hometown of Straight River, Minnesota. While he’s settling the estate, an old friend and neighbor asks him for help. Her husband’s recent death was ruled a suicide. She insists it was not. Ownership of her farm hangs in the balance. The local police are uncooperative, so Matt turns to his ex-wife and a young computer prodigy for assistance. As new information surfaces, Matt suspects the two deaths are connected to a violent conspiracy with national implications. His dilemma: Should he risk his life to protect his friend and hundreds of other farmers from ruin? Chris Norbury is the award-winning author of the suspense-thriller Castle Danger. His new novel, Straight River, is the prequel to Castle Danger and the first book of a planned trilogy. The stories feature Matt Lanier, a southern Minnesota farm-kid-turned-professional-musician whose middle-class world is turned upside down by a conspiracy of powerful, ambitious, violent men. Chris grew up in the Twin Cities and earned a B.S. in Music Education at the University of Minnesota. His essays on wilderness canoeing have been published in the Boundary Waters Journal. A volunteer Big Brother since 2000, Chris donates a portion of all book sales to Big Brothers Big Sisters of Southern Minnesota. During the golf season in Minnesota, he works on perfecting his golf game. It’s an impossible dream but also a good excuse to get out of the office. He lives in Owatonna, MN with his wife and golf clubs. Today I welcome Delight Delure, former owner of Ella’s Enchanted Forest and current owner of The Pink Percolator to my blog. Delight is one of Granny’s best friends and also is the niece of Jezabelle Jingle of Brilliant, MN. Let’s see what Delight has to say. Wow, I can’t believe I am actually a guest on a blog. Usually it is Granny that gets that honor. Let me see, what can I tell you about myself? I was the former owner of Ella’s Enchanted Forest. It was a bistro type experience. I served coffee, tea, my own made up concoctions and goodies to my customers. Trees and plants were a huge part of my business too. I was the go-to place for funerals, weddings and “just because”occasions. I actually had trees growing in my building with the ceiling extended so they could grow and thrive. But all that ended when Granny got me involved in a new investigation of hers. Someone stole my trees and planted them in Granny’s back yard. Then we found out the floor moved down into the underground streets. Gravy, that’s Gile Graves, owner of Graves Funeral Home, thought my building would be the perfect place to relocate his mortuary because when the weather was bad, they could transport the casket to the Mausoleum in the cemetery by way of the underground streets. The city thought so too so they gave me funds to build my own new coffeehouse so Gravy could move to my building. You can’t miss the Pink Percolator if you drive into Fuchsia. It is shaped like a giant percolator, pink of course, attached to a teapot addition. In the middle is our patio with our whipped cream fountain. It really is a better place for me to create my concoctions. I have a daughter and her name is Ella. She helps me with the coffee and tea along with falling in love from time to time with various men in this town. My husband is dead but that doesn’t mean I am not looking to replace him. Don’t tell Ella, that might upset her. My Aunt Jezabelle lives in Brilliant. She is more my age but she is still my aunt. I can’t mention her name in front of Granny because they are a little competitive. Jezabelle solves crimes too, and Granny doesn’t always approve of the way she does it. I think Granny is just being ornery and doesn’t want to admit that maybe together the two would be a dynamic duo. Just my opinion. Folks in Fuchsia are friendly. I know most of what goes on. I eavesdrop on conversations and I have been known to mike a table so Granny and her gang can find out what the men are up to. They seem to think all we should do is knit. The last time Granny held a knitting needle she skewered someone. I also have a van, although Granny finally added to her car collection with a van so I don’t always have to use my business van to drive us on our escapades. Her van is Fuchsia so it does get noticed, but then no one outside of Fuchsia suspects a group of little old ladies can be cunning and dangerous. I have Granny to thank for helping me have faith in myself too. My husband usually made all the decisions. I thought I couldn’t think for myself but with Granny’s help, I know I am a successful delightful woman. I like to giggle. It’s up to you to guess what I might be giggling about. I will tell you it might shock you. It’s time to go. I need to come up with a new coffee drink. Granny made Mavis a drink, an alcoholic drink with coffee to make her quick blubbering. I need to mimic it but leave out the tequila, or maybe I won’t. Until next time. It’s been fun. You can find Delight Delure most days in The Pink Percolator and getting in trouble with Granny from the Fuchsia, MN cozy mystery series. Or visiting her aunt in Brilliant in the Brilliant, MN series. Make sure you leave a comment or a tip on a new coffee drink or pastry delicacy that Delight can try. You can find Delight and the books here. Today Franklin Gatsby is visiting my blog. Franklin will tell you about his life, how he met Granny and came to reside in Fuchsia. We meet Franklin for the first time in Granny Hooks A Crook. Welcome Franklin. I am happy to be here today. Most of the time the women in this series get the most publicity. I guess you could say the women in Fuchsia attract publicity and trouble, like honey attracts flies. Isn’t that what they say? I am never sure about old sayings anymore since I met Hermiony Vidalia Criony Fiddlestadt. She turns sentences upside down and keeps you wondering who the confused one is. I moved to Fuchsia from New York City, retiring from my career as a detective back in the city. A quieter life was what I was looking for, but also an interesting one. I closed my eyes and put my finger on the map and it landed on Fuchsia, Minnesota. I had never heard of the town and Minnesota wasn’t even on my radar, but I decided you only live once and here I am. Fuchsia surprised me. The first time I hit a pothole and reported it to the street department they laughed at me. The city boys explained to me if they kept the potholes, it slowed people down. They didn’t have to install rumble strips. Now I think the only person they want to slow down is Hermiony, or Granny as she likes to be called. She’s a word I can’t mention—on wheels. I expected quiet and then they had a murder, found some underground streets, have a flamingo festival in winter and the women…they think they own the place so I questioned my decision to move. Granny actually fell in to my arms, probably tripping over the umbrella she used to carry. It was an interesting meeting. I wouldn’t want to cross her with that umbrella because she knows how to use it, and I don’t mean to protect herself from the rain. I do have family. My grown daughters finally moved to Fuchsia but that’s a story for another time. Granny reminds me of my mother. My mother drove me crazy. I thought Granny drove me crazy in a good way, now I am not so sure, but she sure makes life interesting. After adjusting to life in Fuchsia I got back into the swing of things helping the local police keep track of Granny and helping out on their investigations. There seem to be too many shysters running around this town too, and I don’t mean the two legged kind. I love animals but this town loves, loves, animals. These people protect their own. I hear my wife calling. Yes, I am married now. That too is a long story. It seems the new amusement park in Fuchsia is almost done and Lars, Granny’s nephew, is stuck on top of the new ferris wheel and needs to be rescued. Why they need this old detective for that I have no idea. Visit us soon in Fuchsia. I think I am here to stay. After all those women always seem to catch their man and I was led astray and became one of them. Watch out if you visit. Your life may be compromised one way or another. That was interesting. Thank you Franklin for visiting. You will find Franklin living in Fuchsia and still in the business of hunting down those who put others in danger. Although I am not sure if that means the crooks or Granny and her cohorts. Today I welcome Granny’s friend, Mavis, to the blog. Mavis lives across the street from Granny. She introduced herself in the first book, Granny Hooks A Crook. Let’s see what Mavis has to say. Hi, it’s me, Mavis. If you are looking for my picture you are going to look for a long time, because I save this beautiful mug for my pretend reality series only. I live across the street from Granny. I am known for producing and starring in my pretend reality series. The name of my series changes depending on what reality I feel I am in at any given moment. Granny and I go way back to when she first moved to Fuchsia. She used to be boring but once her kids were grown she changed. I don’t quite know how to describer her —maybe wacky and wild. Yes, that’s it, wacky and wild. But enough about Granny. This is supposed to be about me. I lived alone in my neighborhood. I passed the time hanging from my ceiling by my window. I needed that attention. Or sunbathing on the roof of my house in my bikini. I don’t want to hear I am too old for that. Doing that caught the attention of my neighbor George. I did have a sister. We weren’t close. She stole my chance at fame when we were younger. You can read all about that in Granny Pins A Pilferer. Granny has this fear of wrinkle farms, but when we did a stint together there I found it to be a great place to meet men. Life was very quiet until I got pulled into Granny’s shenanigans. I never thought I would worry about my life being in danger. Finally, I got the house of my dreams. Of course, it happened after Silas’ house, which is next to mine, blew up and damaged my home. That was a blessing in disguise because now my home looks like a giant television and I can act in front of the big screen. Do you suppose I might get an Oscar someday? I don’t have any kids. Granny’s kids are like my own only they let me live my life the way I want. Or maybe I live my life the way Granny wants. I have to think about this. We have been in a lot of trouble lately. As far as romance—do you see me raising my eyebrows and winking? You’ll have to follow me in the series to find out if I do or I don’t visit Red Hot Momma’s Boutique. I do like the Go Belly Up Casino. I hope it doesn’t go belly up. It’s been nice meeting you. Ask me questions. I might or might not answer. Make sure to introduce me to your friends. I’ll try to corrupt them and they will thank you. Toodles for now. I do have a secret to tell you. Or maybe I don’t. If I tell you it won’t be a secret. You can find Mavis in the Fuchsia, Minnesota Series. You Can, You Can’t, It’s Another Granny Rant! 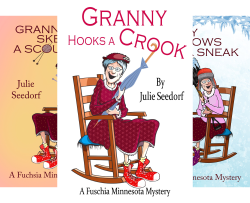 Granny Bricks A Bandit the sixth book in the Fuchsia, Minnesota Cozy Mystery series is finally here. It’s getting rave reviews but one reader brought up a subject I thought I would address. This fabulous reader felt Granny is a tad more subdued in her new adventure. I thought about the criticism and it might be valid. Over the next few weeks some of the residents from Fuchsia will visit my blog. Hopefully Wednesdays will be visiting day but remember, Granny says life is to be lived so if something better comes up, my character for the day might follow a different path which leads them to mischief. But for today, here’s Granny. Hermiony Vidalia Criony Fiddlestadt, yup, that’s my name. My mother was in a rhyming phase when I was born hence Hermiony Criony. At least she put Vidalia in there. My mother loved onions. She especially liked the Vidalia onion and I was the lucky one in my family that was named after an onion. I’m being sarcastic in case you can’t tell. You might guess I am not a lover of onions. Why couldn’t she have named me Cocoa after chocolate. I love chocolate. I grew up wanting to run with my brothers. We had an apple orchard and I got out there as often as I could. I stopped some apple bandits one day but my mother and father never found out about that. I would have had to do inside chores forever if they would have known. I always knew I could do anything I set my mind to but life in the time I grew up wasn’t a piece of cake for women’s lib, in fact they probably never heard of it. I didn’t want to disappoint my parents, unlike a few of my siblings who I won’t name here, so I stayed home and became the daughter they always wanted. Ferdinand, my first husband, walked on water with the folks. There wasn’t much I could say when they wanted me to marry him. I caved. My spirit was kind of tromped on but I kept it alive secretly hoping someday I could have a different life. I never let go of the hope. Then Ferdinand died. How could he leave me with all that responsibility. A part of me secretly felt free when that happened, but I remembered the kids. Ferdinand was a good man but he certainly had an idea of where a woman’s place should be and it wasn’t the same place I thought it should be, but because of the kids I held back. And then he died and I still did things the way I was expected. My kids grew up. I raised them up in the way they should go and they went Ferdinands way, so now I wonder what would have happened if I would have showed the real me. Between you and me, my kids are kind of boring, always following the rules and doing things the way everyone thinks life should be lived. Once they were grown I could finally let it all out. I could be me. OK, you’ve got me. At first I kept it hidden. I wasn’t deceitful to my adult kids because I was scared of them, it I felt wasn’t worth the effort to fight with my kids, in fact it was kind of fun to pull the wool over their eyes. Until, that is, they wanted to put me into the wrinkle farm. I knew I had to do something fast and it came to me. I needed a fiance and I found one. However, my fiance didn’t like my secret life. I was undercover for the city of Fuchsia. He tried to tell me what to do. He told me I drove him crazy like his mother did. I never did meet her but I have a feeling we would have been friends. Now I have a great group of very quirky friends. I found myself a man that accepts me as I am…maybe. I live in a wacky community that fits my wacky way of thinking. What more could I want? So I will answer the question. Am I more subdued in Granny Bricks A Bandit? Maybe, or it could just be a ruse for the next book or… happiness has a way of toning me down. Did you notice I’m not as crabby as I was? Did you notice I am not as secretive? It’s also called Angel and Herman, my young grandchildren. I want them to know I’m a little different, and it’s true, all they have to do is look at my house to see that I’m different. I have to go. The shysters are in trouble and we still haven’t figured out who Roost belongs to. So let’s put it this way. in case you are still wondering about me toning myself down. You’re on a need to know basis and I don’g know what you need to know because I don’t know what I need to know so how do you expect me to know you need to know what I don’t know. Leave a question. I might answer. Granny Bricks A Bandit is also available on Kobo, BarnesandNoble.com, Nook, Walmart E-books, and more. Here’s the link. Mabel and Flori are not strangers to me. I became their fans when I read the previous books in the Mabel Wickles Cozy Mystery Series. Mabel is the main character in these series, an older woman, an amateur sleuth and a very interesting character. Flori, is her friend and gets dragged into Mabel’s sleuthing adventures. This time they take themselves out of their comfort zone which is their little community of Parson’s Cove. They take a chance and travel to Yellow Rose, Texas. and an adventure where not only do they try to to track down a murderer, but meet new friends with cultural differences they are not used to. It makes for an interesting read and an even more interesting mystery. The writing is superb in that it has more twists and turns and clever plots to keep a reader on their toes. I would definitely give this five stars. You won’t be disappointed. I can’t wait until the next book in this series. As most writers, Sharon started writing short stories. After having several published and finding it hard to squeeze a story into only a few hundred words, she decided to follow her dream and write novels. Her book, VIRTUAL ENEMIES, is a mystery and introduces readers to Beryl Swallows, a retired police officer and now a private investigator. In this story, she is hired to solve a murder – by the victim herself. A mystery within a mystery. This is the first in the Beryl Swallows Mysteries. In the second, CASE CLOSED.not, Beryl finds one of her mother’s old diaries and it takes her back into a past she never knew existed. Was her own mother a murderer? Sharon has four current books in the Mabel Wickles mystery series: DECEPTION BY DESIGN, CALAMITY BY THE CAR WASH, COLD CASE CONUNDRUM, and FROZEN IDENTITY. Mabel is good at finding trouble; however, along with her friend, Flori, and other Parson’s Cove citizens, she always seems to find the way out. And find the guilty party! Besides writing mysteries, Sharon writes historical fiction. Her first historical fiction, SARAH’S VALLEY, carries us on a journey from the east coast of the United States, through the Midwest, and up into Canada. The sequel, RETURN TO SARAH’S VALLEY, continues the story. Now it is Patrick’s turn to tell his life story to one of Winnipesaukee’s descendants. Her second historical fiction, THE WIDOW’S WALK, centers around life in the early 1800s on the Texas Panhandle and down to the island of Galveston. A poem written by the author’s mother, Ellen Bunse, in 1929, was the inspiration for Sharon’s latest book, OLD HOUSE. The house was built in the 1860s and through the next hundred years, you will read of all the people who found shelter within its walls, from a Texas cowboy with a bounty on his head, an old prospector, and a woman seeking refuge. Sharon’s books contain no graphic violence, sexual content, or coarse language. Sharon Mierke and her husband live in Manitoba, Canada, where the summers are hot and the winters, cold. Their second home is Galveston, Texas, where they have established many friendships over the past twenty-some years. They have four grown children and four grandchildren. Sharon’s hobbies include reading, scrapbooking, and photography. Join Sharon on Facebook, Twitter, Instagram, and Linkedin. I am an M. E. Bakos fan. I will let you in on a secret. I actually know her in the flesh, not just online. Having said that, those of you that know me and the books I review are aware of the fact I only review books I like. I can’t see any reason to give someone a bad review. If you are reading my reviews know that I give four and five stars and if I don’t like a book, you will never know I read it. Having got that out of the way Deadly Flip was a book I thoroughly enjoyed reading. This is the second book in the series. A hidden diary, a house flip, a quirky ex-husband, a hunky sheriff and main character who is a great amateur sleuth without becoming annoying, all come together in a mystery which weaves an interesting story with an ending which will surprise you. What more can you want? When a cozy mystery makes me feel that I want to settle in to the community and become a friend of the characters it is a winner with me, and this book does all of that and more. Definitely a Five Star mystery. I have published several short stories in national women’s magazines. My love of mysteries has led to writing cozies. My first mystery short story, “Carpe Diem or Murder at the Carp Fest” appeared in the Festival of Crime, a SINC Anthology. My second, “Perfect Storm. . . Perfect Murder” is in Dark Side of the Loon, also a SINC Anthology. As an enthusiastic fan of home improvement shows, I have done numerous projects through the years. A fun fact: As an intern with a Minneapolis non-profit housing agency, I researched, wrote and edited a monthly home improvement newsletter. I am a member of Twin Cities Sisters in Crime, the SINC Guppies Group, and an alumna of the University of Minnesota. DEADLY FLIP is my latest Home Renovator Mystery. FATAL FLIP is my first cozy mystery novel. Published by Cozy Cat Press. I am a lifelong resident of Minnesota and reside in Minneapolis with my husband Joe Sebesta, and our spoiled Morkie. Flipping houses can be deadly! Katelyn takes on a home renovation in Hiptown, Minnesota, that “has history . . . a murder” at BFF Myra’s urging. What was she thinking? Besides the young woman being killed by the home’s prior owner, she learns the girl didn’t get the justice she deserved. Because of a double jeopardy ruling, the killer got away with murder! Katelyn finds a hidden diary, foils an intruder, and discovers more secrets while delays and expenses escalate as she renovates the house. Could the victim’s restless spirit be haunting the house, making it the rehab from hell? Can she find peace and justice for the dead woman? To get the renovation back on track, Katelyn, Myra, ex-hubby Eddy (it’s complicated), and handyman Wayne hold a séance and bring in paranormal investigators. Will this finally rid the house of bad karma? To top it off, Eddy is acting just plain weird, and hunky Sheriff Don Williams is a puzzle. Nosy neighbor, Mrs. Gilman, and Boots, the rescue cat, add to the fun in the second Home Renovator Mystery. Just a little reminder from all of us authors to all our readers. Reviews help so if you like our books please leave a review wherever you bought it. Did you hear her yell the words “I’m Back?” Yes, Hermiony Vidalia Criony Fiddlestadt is back. From a water-skiing mishap where she finds a dead body to a trip to the Mall of America — have you seen Granny’s freeway driving — the Ecstatic Emporium is being reopened as an escape room venue and Granny’s granddaughter, Angel, thinks she needs to be like Granny. What more could you ask for in the sixth book in the Fuchsia, Minnesota Cozy Mystery Series? Not only is it now available on Amazon on Kindle and also in print, but it is available on KOBO, Nook, at BarnesandNoble.com, on Overdrive for Libraries and other venues. Granny, Hermiony Vidalia Criony Fiddlestadt, is dear to my heart. When I began the Fuchsia Series I wasn’t sure where it would go. I had intended to end it at the fourth book but my readers wanted more, and so hopefully I can keep up the momentum. In this book Granny is a tiny bit more serious. She is getting older, aging is a fact of life in our real lives but should we address it in he cozy mystery series? Do you all feel that’s a no-no? I haven’t decided. What I do know is that Angel is getting more like her step-grandmother every day and maybe she will have to step in and learn from Granny and her friends. Granny’s life has not always been easy. She was forced as a teenager to quell her wild ways, get married to a wonderful man but one who felt women should do what they are told, and she tried to comply, raising her children the way society felt she should. As she got older she realized she has to be who she is which is witty, silly and unconventional. It is a lesson for all of us on living our life. Fuchsia is a fictional Minnesota community. I never mention where it is, just like I never mention Granny’s age. I like to leave that to the readers imagination. I made Fuchsia non-conforming too. Our communities have become clones and we are restricted on what we can do with our yards and even the color of our homes. I grew up in a time where the restrictions were less and we could be creative on our properties. I did grow up in a pink home, two of them in fact. Neighbors maybe didn’t always agree with what we did, or what we had in our yards, but people were respectful of each other and they weren’t so much into the perfect yard. I happen to love dandelions and so did my mom. That’s it in a nutshell. I hope you enjoy the journey of Hermiony Vidalia Criony Fiddlestadt and her family and friends, and the community of Fuchsia where wacky rules. Laugh, enjoy and get away from reality for a smidgeon of time. While you’re at it, don’t forget about the Brilliant Series. It is brilliant. Sally Berneathy was a new author for me. Death By Chocolate was the first book I read by this author. At the same time I bought this book another friend of mine, Twin City Sinc President and Member, Timya Owen posted about it on her Facebook page. I knew I was on to something because Timya reads only the best. I love this author’s writing style and the book. It drew me right into the story, was a little quirky and had characters I could relate to. It was a refreshing fun mystery that is well written and keeps you wanting more. And more I will get because this author is now on my list of favorites. I will let the blurb on the book explain the mystery but take my word for it, if you are a cozy fan you will want to pick up a book by Sally Berneathy. Just because she is new to me doesn’t mean you might not already be reading her books because she is a USA Today Bestseller, I am happy I found her. Lindsay loves chocolate. It tastes good, it makes her feel good, it never cheats on her like her almost-ex-husband. It’s her best friend. But someone wants her dead and uses her weak spot—chocolate—to try to murder her. Lindsay’s only secret is the recipe for her chocolate chip cookies, but she is surrounded by neighbors with deadly secrets. Suddenly she finds herself battling poisoned chocolate, a psycho stalker, and a dead man who seems awfully active for a corpse. Her best friend and co-worker, Paula, dyes her blond hair brown, hides from everybody and insists on always having an emergency exit from any room. Secrets from Paula’s past have come back to put lives in jeopardy. Determined to help Paula, Lindsay enlists the reluctant aid of another neighbor, Fred, an OCD computer nerd. In spite of his mundane existence, Fred possesses tidbits of knowledge about such things as hidden microphones, guns, the inside of maximum security prisons and how to take someone down with a well-aimed kick to his chin. As Lindsay battles the elusive stalker, poisoned chocolate, and the dead man, she will need more than a chocolate fix to survive. But that’s always a good start. About the Author which I took from her Amazon page. I hope she doesn’t mind. I grew up in a small rural town in Oklahoma where our favorite entertainment on summer evenings was to sit outside under the stars and tell stories. When I went to bed at night, instead of a lullaby, I got a story. That could be due to the fact that everybody in my family has a singing voice like a bullfrog with laryngitis, but they sure could tell stories–ghost stories, funny stories, happy stories, scary stories. For as long as I can remember I’ve been a storyteller. Thank goodness for computers so I can write down my stories. It’s hard to make listeners sit still for the length of a book! Like my family’s tales, my stories are funny, scary, dramatic, romantic, paranormal, magic. Besides writing, my interests are reading, eating chocolate and riding my Harley. Currently I have written six Death by Chocolate mysteries: Death by Chocolate; Murder, Lies and Chocolate; The Great Chocolate Scam; Chocolate Mousse Attack; Fatal Chocolate Obsession; and Deadly Chocolate Addiction as well as four Charley’s Ghost mysteries: The Ex Who Wouldn’t Die; The Ex Who Glowed in the Dark; The Ex Who Conned a Psychic; and The Ex Who Saw a Ghost. More in each series will be released as soon as I can copy them from my brain to the computer! I have sold fifteen romance novels ranging from comedy to dark suspense under the names Sally Carleen, Sally Steward and Sara Garrett. For these novels, I won several awards including National Readers’ Choice, Romantic Times Best Silhouette Romance and two Rita finalist slots. Most of the Silhouettes are available as e-books, and I have e-pubbed six of the out-of-print single titles. Contact information is available on my website. I love to talk to readers! Okay, I just plain love to talk!